This was a make it up as I go project. First I started with a shiny brass lamp I found for $2.00 at a junk store. Of course, I started painting before I remembered the camera. 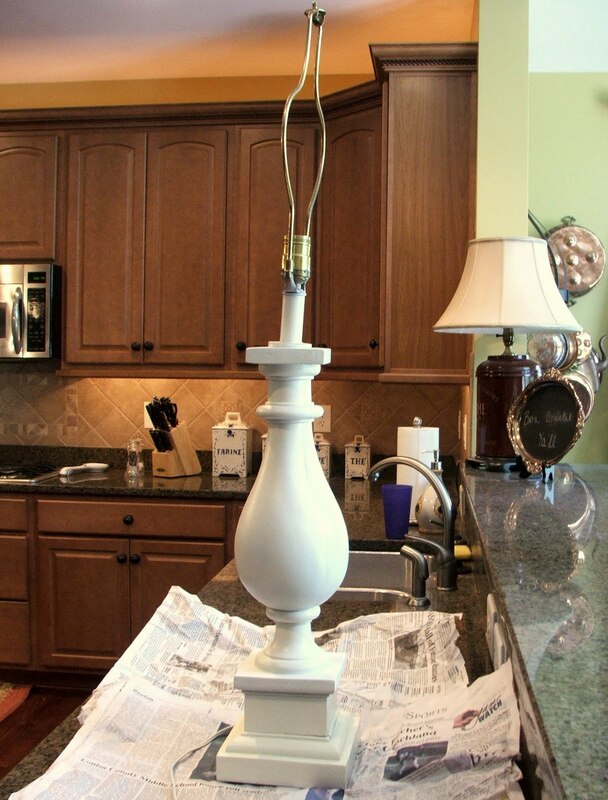 First I spray painted the lamp two coats of white. 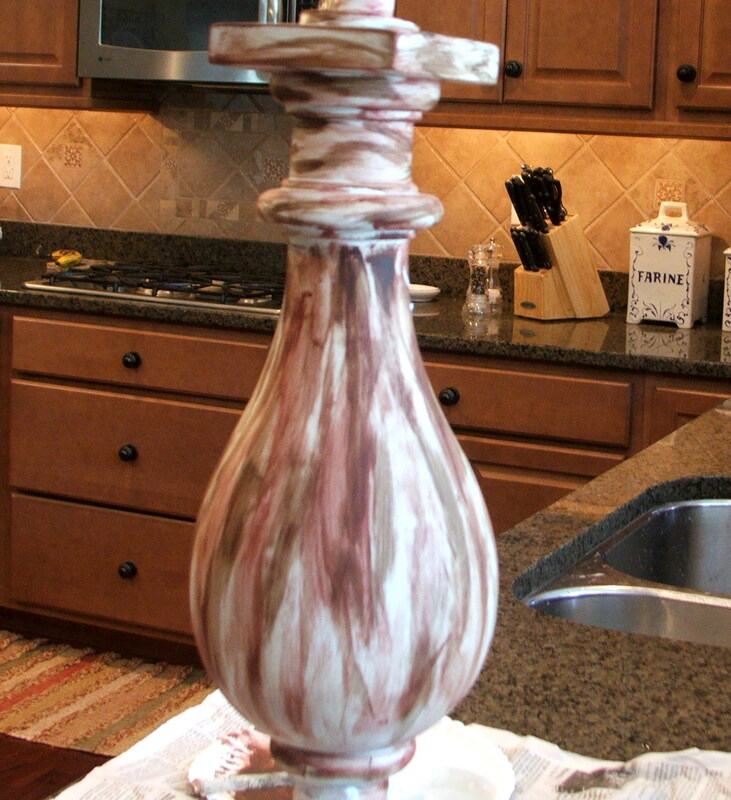 Next I took craft paint in Burnt Umber and Brick Red and dry brushed these colors on the lamp. I was trying to achieve a rusty appearance. You want to leave some of the white showing. At this point I am thinking this is the ugliest thing and I should just abandon this project! It could not look any worse so I decided to persevere. Next I took wall Spackle and randomly applied it to the lamp. I started out using a small trowel but found out it worked better using my fingers. Leave areas of the dark paint showing. Just play with the Spackle until you get a look you are happy with. Below is the final result. If you wanted a smoother appearance use your dampened finger to smooth while the Spackle is still wet. You can also lightly sand when dry. I hope everyone is having a great Memorial Day. We celebrated yesterday with our son and family. Our community pool opened this weekend and the grandchildren had so much fun swimming. Afterwards we had a cookout at our house. It was a fun time and good food. Drop by the following parties and look at all the projects and goodies for this week. Great process! 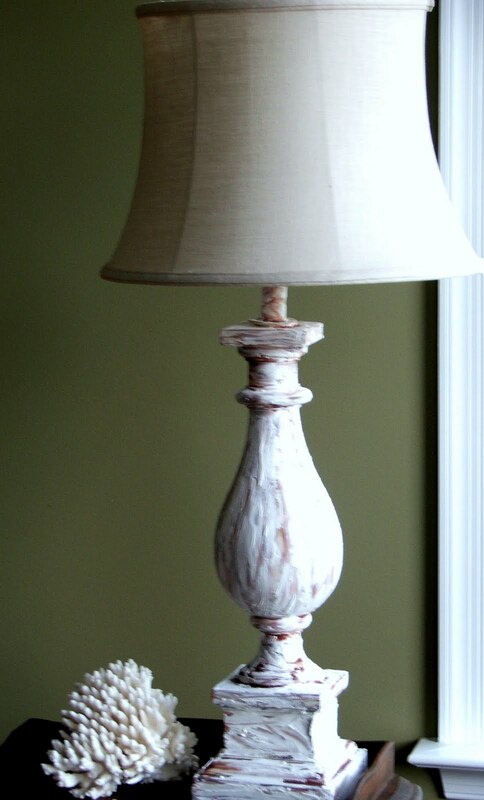 You took an old lamp and turned in to a cottage dream…love it! That was very ingenious!! Love how it turned out. Wow, that looked like fun playing with paint and spackle. Looks old and crusty for sure. This really looks like a vintage find now! Clever woman! This is so cool, Sherry! I love it! Yep i like it too well done for carrying on! What can I say, brilliant! Smart!!! and easy to do! Your lamp looks fab, congrats!!! What a fun project! Something you'll enjoy every day and a great look! Your lamp turned out wonderful! You just saved yourself a ton of money, because anything with that great finish costs a fortune! This is my first White Wednesday, and I'm very happy to meet you! It looks gorgeously shabby chic now! =) Coming over from Coastal Charm and a happy new follower! I love that you kept going, it looks fabulous! Great idea, glad you kept going, the result looks wonderful! SHUT UP! This looks GREAT!! It is a good thing you just kept going because it really looks FAB!! That turned out great!! I love it. I think it looks terrific!! Hmmm, that technique looks familiar…..your lamp turned out nice! The lamp is awesome. You are so good at creating things. I had an antique store years ago and I really enjoyed the time spent there. I appreciated your thoughts and hope you come back to visit often. That incident happened twenty years ago and it was a great learning experience for a novice. Hopefully I won't forget the lesson learned.